Diana Abu-Jaber promotes Birds of Paradise. Join the Octavia Book Club for a discussion of Diana Abu-Jaber’s Crescent. The Octavia Books Book Club meets at 10:30AM on the 3rd Saturday morning of each month and is open to book lovers. Please feel welcome to join us! Diana Abu-Jaber reads from Origin. First Wednesday Reading Series: October 1 are Craig Lesley, Primus St. John and Diana Abu-Jaber. Craig Lesley; Primus St. John; Diana Abu-Jaber reads from Origin. Oregon Literary Review co-hosts First Wednesdays, a series of readings, performances and wine-tasting at the Blackbird Wine Shop, 3519 NE 44th off Fremont, 7-9pm. Readers and performers interested in participating should contact Julie Mae Madsen at maemadsen@gmail.com with an expression of interest and sample work. The readers/performers for October 1 are Craig Lesley, Primus St. John and Diana Abu-Jaber. Craig Lesley is the author of 4 novels and a memoir, along with numerous other works. He has received three Pacific Northwest Booksellers Association Awards, the Western Writers of America Golden Spur Award for Best Novel, and an Oregon Book Award. He has been the recipient of several national fellowships and holds a Doctorate of Humane Letters from Whitman College. Currently the Senior Writer-in-Residence at Portland State University, Craig lives with his wife and two daughters in Portland, Oregon. Both Storm Riders and The Sky Fisherman were nominated for the Pulitzer Prize. When Professor Primus St. John joined the PSU faculty in 1973 he already enjoyed a national reputation as a fine poet. Since then he has published several collections of his poems, edited two anthologies, helped create the NEA-funded Poets in the Schools Program, won the Western States Book Award for Poetry (2000), and the Oregon Book Award for Poetry (1990). In 2000 he was a finalist for poetry for both the Oregon Book Award and the PEN West Award. Professor St. John has participated in countless readings and taught hundreds of students to write creatively and think critically. Currently he is completing a collection of new poems based on historical and Caribbean themes where he continues his examination of people, their circumstances, and how they deal with those circumstances. Diana Abu-Jaber’s latest novel, Origin, was named one of the best books of the year by the LA Times, the Chicago Tribune, the Washington Post, and won the 2008 Florida Book Award. Her memoir, The Language of Baklava, won the Northwest Booksellers’ Award. Her novel, Crescent, won the PEN Center Award for Literary fiction and the American Book Award. Her first novel, Arabian Jazz won the Oregon Book award. Diana Abu-Jaber is a LibraryThing Author, an author who lists their personal library on LibraryThing. Diana Abu-Jaber's book Birds of Paradise AUDIO EDITION was available from LibraryThing Early Reviewers. 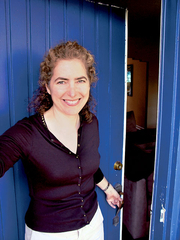 Diana Abu-Jaber is currently considered a "single author." If one or more works are by a distinct, homonymous authors, go ahead and split the author. Diana Abu-Jaber is composed of 3 names. You can examine and separate out names.